Heuchera 'Heureka Purple Majesty' features rich rose colored leaves with maroon veining. 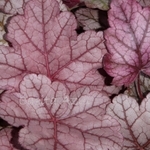 The undersides of the artfully scalloped leaves are a solid maroon, as are the matching flower stems that hold up the light Pink flowers. Compact and cute, these strong growers look as great in a container as they do in the garden. The best color is achieved when the plants are in at least a little direct sunlight. PPAF.